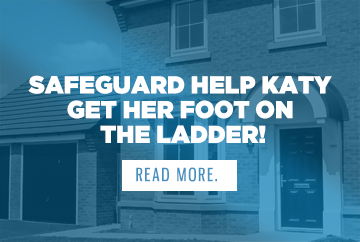 Katy & Partner Luke Settled in Their New Build With A Little Help from Safeguard. After contacting Safeguard, Katy and her partner Luke, have finally moved into their new home. We caught up with Katy after moving into her new build to see how she found the move and purchasing her first home. Safeguard: Firstly congratulations on getting moved into your new home, it must be great to finally be moved in and officially be a homeowner? Katy: It’s amazing. I still don’t think it’s quite sunk in! I moved home for 18 months to save for a deposit, so it’s a lovely feeling to go back to our own home on an evening now! Safeguard: What was it about the Stella Riverside Development that first caught your attention? Katy: We’d always known we wanted to live closer to Newcastle, but we also work in Durham so need to commute each day. The development is 10 minutes drive from the city centre, and close to the A1. Once we viewed the show home for the house, we knew it was the one for us! Safeguard: You purchased your new home with the Help to Buy Scheme, how easy did you find the scheme? Katy: Super easy! To be honest, there was very little for us to do; Safeguard handled the application in full. Safeguard: Helping you find the right mortgage was a privilege for us, being able to help you buy your first home, how was the application process for you? Katy: It was really simple. The property developer for our home recommended us to SafeGuard, so we made an appointment and ran through our options. We opted for a mortgage with a fixed term of 5 years, and our plan is to overpay each month. Having no fee made life a lot easier too; there are a huge number of things to pay for when you buy your first home, so anything fee-free is a bonus! Katy’s Advice To First Time Buyers. Safeguard: What advice would you give to other first time buyers who may think that finding a mortgage is unrealistic or unachievable? Katy: Keep saving; it’s absolutely worth it! Make an appointment with a mortgage advisor at Safeguard to get a feel for your options; they’ll advise on what house price range you qualify for, what your repayments may look like…all of the important stuff! For mortgages, we can charge a fee of £295, commission from the lender or a combination of both.